The Conserve Wildlife Foundation of NJ in partnership with the NJ Endangered and Nongame Species Program has released the 2016 NJ Bald Eagle Project Report and the new and improved Eagle Tracking Maps. In 2016, 172 eagle nests were monitored during the nesting season. Of these nests 150 were active (with eggs) and 22 were territorial or housekeeping pairs. A record high of 216 young were fledged. The success of the NJ Eagle Project is due to the dedicated Eagle Project Volunteers who monitor and help to protect nests throughout NJ. One hundred-seventy two nest sites were monitored in 2016, up from 161 in 2015. Fifteen new eagle pairs were found this season, twelve in the south and three in central NJ. One hundred-fifty pairs were known active (meaning they laid eggs), the same number as 2015. One hundred thirty-two nests (88%) were known to be successful in producing 216 young, for a productivity rate of 1.44 young per known-outcome active nest, which is above the required range of 0.9-1.1 young per nest for population maintenance. Twenty (12%) nests failed to fledge young. The Delaware Bay region remained the state’s eagle stronghold, with 47% of all nests located in Cumberland and Salem counties and the bay side of Cape May County. 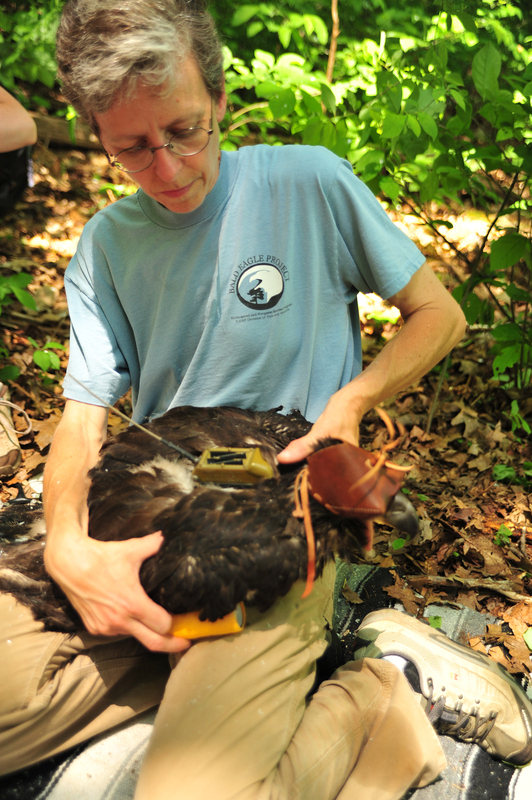 Since 2011 CWF and the ENSP have been attaching GPS transmitters to young eagles to follow their movements. The data collected from these transmitters are allowing us to learn more about the life cycle of juvenile bald eagles and how they interact with our human dominated landscape. Most importantly, the data is helping biologists to identify and protect communal roost sites. These sites play a significant role in the life cycle of non-breeding, sub-adult eagles. They are protected under a “disturb” clause of the federal Bald and Golden Eagle Protection Act (16 U.S.C. 668-668c). With the data we’ve collected we are beginning to identify and map these sites so that they can be protected. Please visit our website to view the updated tracking map, which allows users to more clearly view the movements of the four eagles that we’ve tracked (no more multicolored spaghetti all over the map!). This project was funded in part by the American Eagle Foundation, we are extremely grateful for all their support. This entry was posted on Friday, January 13th, 2017 at 8:00 am	and is filed under Birds, Eagles, Mapping, Raptors, Volunteer Programs, Wildlife Protection. You can follow any responses to this entry through the RSS 2.0 feed. Both comments and pings are currently closed.